The fencing program’s record for wins in a season is six. This year’s team currently sits at 5-1 with two matches on the schedule next week. The first of those matches is against Beaver Country Day, a team Belmont Day has already seen twice, losing the first (15-12) and winning the second (14-13). 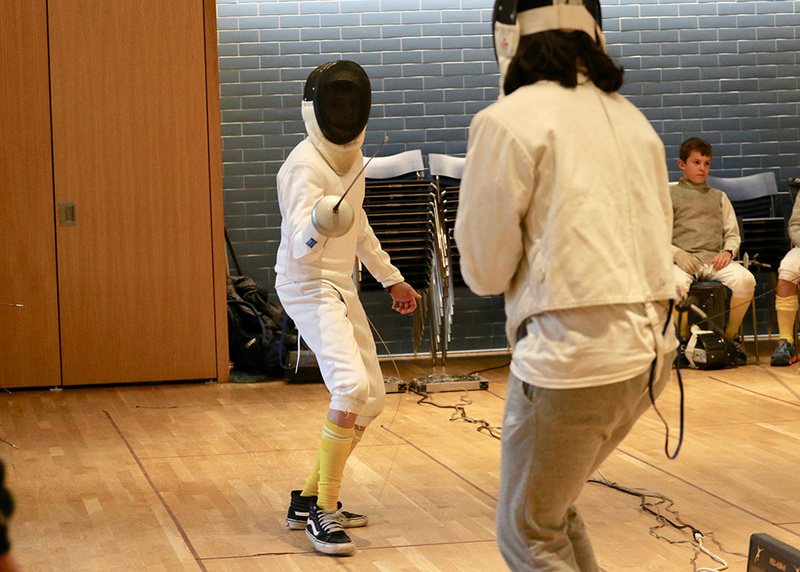 To have a chance at the record, the team will need standout performances from their most talented fencers, including Henry Buckley-Jones, Ashley Luo, and Paul Lyons. Over the course of the season, these three athletes have been instrumental to the team’s success, both on and off the strip and have set a great example for their less experienced teammates. The wrestling team took eight out of 10 matches against Lexington Christian Academy this week. Highlights included Cameron Colbert’s win by pinfall with a cross -face cradle and Evan Seymour’s dominating performance. After taking a one-point lead into the half against Shady Hill, the girls’ varsity basketball team finished with an 18-point win. Camille DeStefano and Julia Clayton combined for half the team’s points. Owen Finnerty logged serious minutes on the wing and netted a pair of important three’s during boys’ varsity’s 43-42 loss at Shady Hill this week. Owen Khanna had a solid defensive game. Kendree Chen has evolved into a confident and consistent player for the badminton team this winter, thanks in part to her ability to force her opponent deep and then use a drop shot for the point. Elena Dainora-Cohen, Mina Cho, and Jazmin Cruz have all improved significantly over the course of the season and are prepared to continue their volleyball careers in high school. The girls’ JV basketball team hung tough against a talented Carroll squad, eventually losing 24-18. Milly Noble and Kiki Friedbauer played great on both ends of the floor. Toby Gauld knocked down a big three during boys’ JV basketball’s 34-17 loss at Carroll this week. Alexander Colangelo led all scorers. Henry Monroe was solid on the defensive end.